When Martin I became pope in 649, Constantinople was the capital of the Byzantine empire and the patriarch of Constantinople was the most influential Church leader in the eastern Christian world. The struggles that existed within the Church at that time were magnified by the close cooperation of emperor and patriarch. A teaching, strongly supported in the East, held that Christ had no human will. Twice emperors had officially favored this position, Heraclius by publishing a formula of faith and Constans II by silencing the issue of one or two wills in Christ. Shortly after assuming the office of the papacy (which he did without first being confirmed by the emperor), Martin held a council at the Lateran in which the imperial documents were censured, and in which the patriarch of Constantinople and two of his predecessors were condemned. Constans II, in response, tried first to turn bishops and people against the pope. Failing in this and in an attempt to kill the pope, the emperor sent troops to Rome to seize Martin and to bring him back to Constantinople. Already in poor health, Martin offered no resistance, returned with the exarch Calliopas and was then submitted to various imprisonments, tortures and hardships. Although condemned to death and with some of the torture imposed already carried out, Martin was saved from execution by the pleas of a repentant Paul, patriarch of Constantinople, who was himself gravely ill.
Martin died shortly thereafter, tortures and cruel treatment having taken their toll. 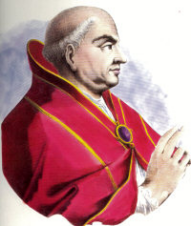 He is the last of the early popes to be venerated as a martyr.